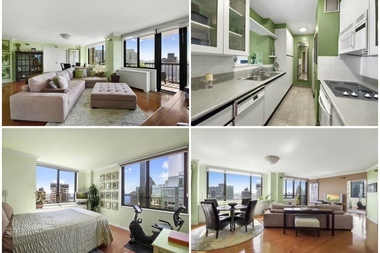 Images of the over-sized living room, kitchen and bedroom of a 2-bedroom co-op at 300 E. 54 St., which is listed for $1.695 million by William Raveis. New Yorkers should expect to see more homes at this price point if the mayor's tax on homes priced above $1.75 million goes through. MANHATTAN — If the mayor's proposed "mansion tax" on homes above $1.75 million wins approval in Albany, the city can expect to see many more homes priced just below that number, real estate experts said. Buyers would likely do whatever they can to avoid the tax, and sellers — hoping to have more buyers to choose from — would likely price accordingly, many said. "That $1.75 million number will disappear completely," said Kathy Braddock, of William Raveis NYC. "It's not going to affect so much who buys, but how we price. You'll see a lot of homes priced at $1.65 million or $1.85 million" since hitting that "mansion tax" price point, she said, represents "a psychological jump." Mayor Bill De Blasio is calling for a 1 percent tax on homes between $1.75 million and $5 million. Homes priced above that would be levied another 1.5 percent tax on the dollar balance above $5 million. In 2014, roughly a quarter of Manhattan homes were priced above $1.75 million, according to StreetEasy data compiled for DNAinfo. The proposed tax — which has the support of the Real Estate Board of New York, the trade association for the real estate industry — would direct revenue to the mayor's $42 billion affordable housing plan. The mayor projects the tax could raise roughly $200 million per year and help build roughly 37,000 affordable units over the next decade. The tax would be on top of an existing 1 percent state tax on homes above $1 million that's also known as the "mansion tax," which was implemented in 1989. Because of the current tax, buyers often negotiate to get deals below $1 million so they can save $10,000, Daniel Hedaya of Platinum Properties said. Real estate expert Jonathan Miller, who authors a market report for Douglas Elliman, plotted out sales trends to show the effect of the "mansion tax" on $1 million homes. He found that there's a critical mass of sales just below that $1 million price point and then activity jumps again at $100,000 above $1 million. If the new tax gets passed, a home costing $1.75 million would see its tax jump from $17,500 to $35,000. "You'll see a lot of closings at $1.745 million," Hedaya said. Michael Greenberg, of the Level Group, thinks the increase could make some families decide to up and leave the city for the suburbs. "In Manhattan, $1.75 million gets you a two-bedroom, not a mansion. It may sound like a lot, but in New York, it's just a little more than average," said Greenberg, who believed it could push out families that the city would likely want to stay here, especially to prop up its tax base. Because some experts believe the current boom could be ending soon, Greenberg says the mayor's plan might be a "quick fix" to meet "short-term budget needs," but may lead to issues down the road. "At least during boom times, like we are in now, people will stretch and pay it," he added. "But once that perception [that they can overpay because of appreciation] changes, it will result in less activity and also a drop in prices." While roughly a quarter of Manhattan homes were priced above $1.75 million in 2014, there were 4 percent of homes above that price in Brooklyn and only 0.3 percent in Queens, The Bronx and Staten Island, according to StreetEasy data compiled for DNAinfo. Because of the geographic impact of the mayor's proposed tax, StreetEasy's Alan Lightfeldt said it "should really be called the 'Manhattan Mansion Tax' [since] one in four homes sold in Manhattan in 2014 would have been subject to the new tax, whereas only a small fraction of homes in the other boroughs would be affected."